This is the second part of a two part article on how to adjust airblast air direction, and air speed/volume. It’s recommended that you read part one first! 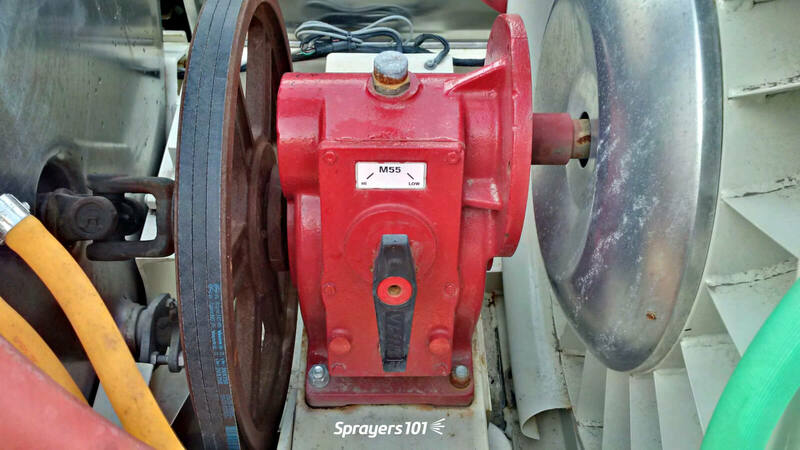 When performed correctly, these adjustments are a qualitative form of calibration that will help you optimize the fit between your sprayer settings and the target you wish to spray. This amounts to better coverage and less waste. A close up of an airblast gear box. There are usually two options – high or low. The weather conditions during spraying will affect everything, so only make sprayer adjustments in conditions you would spray in, or your settings may no longer be appropriate. 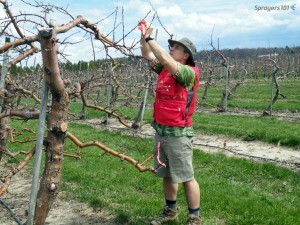 The author tying ribbons on the up-wind side in an apple orchard just past green-tip. The red vest has lots of pockets to hold supplies and sprayer operators can see it clearly for safety. The Hawaiian shirt is because it’s Friday. With deflectors already adjusted and the fan gear selected (if available), choose your tractor rpms (~540 rpm or less) and ground speed (~5.0 k/hr or ~3.1 mph in Ontario). Attach 25 cm lengths of flagging tape on the far side of the plant canopy you wish to spray. 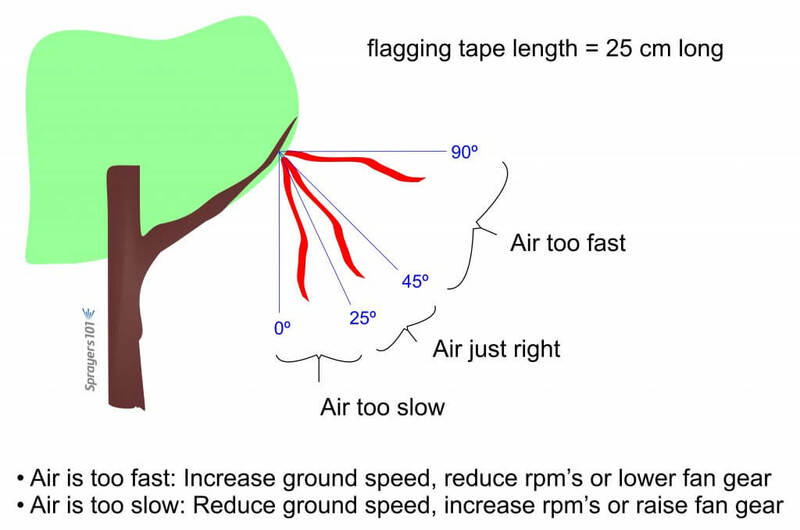 If spraying in a light cross wind, choose the upwind target so the tapes are blowing into the canopy, not away from it. Do this at the top, middle and bottom of the canopy for three plants in a row. This works for bushes, canes, hedgerows, trees, etc. With a partner standing in the next alley, watching the tapes, bring up the rpms and pass by with the fan on and the spray booms off. Attach 25 cm lengths of flagging tape on the far side of the plant canopy you wish to spray. If spraying in a light cross wind, choose the upwind target so the tapes are blowing into the canopy, not away from it. Do this at the top, middle and bottom of the canopy for three plants in a row. 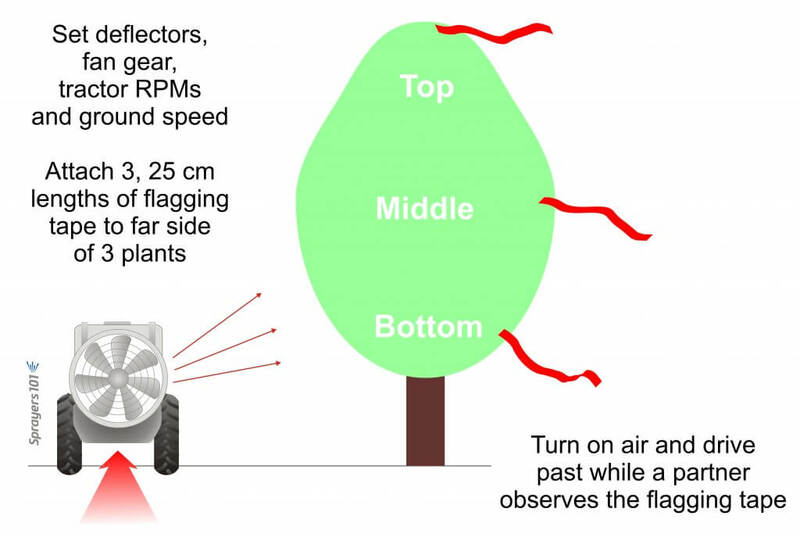 If the partner reports that the tapes did not move, the air from the sprayer may not have been enough to overcome the wind, and/or may not have been enough to penetrate the plant canopy. 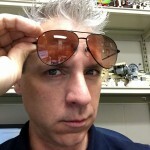 Reduce ground speed, increase rpms, or raise fan gear until most of the tapes move. 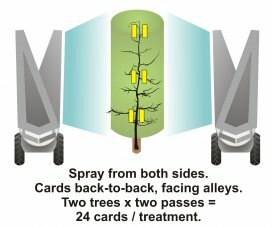 You may not move them all, but remember the goal is to get the air (and spray) past the centre of the canopy, not out the far side. If the flagging tapes stood straight out, there was too much air. Increase ground speed, reduce rpms, or lower fan gear until no tapes stand out. 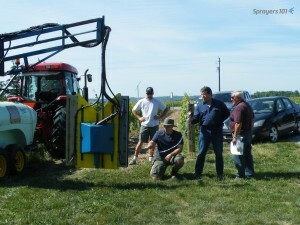 Monitoring air speed with a Pitot meter on a multi-row Gregoire sprayer with suspended, over-the-row fans. Repeat this process this for EACH significantly different crop sprayed with the sprayer. As with air direction settings, multiple set-ups might be needed to reflect each block, or you might choose to group of similarly-sized blocks and calibrate air to the worst case scenario. 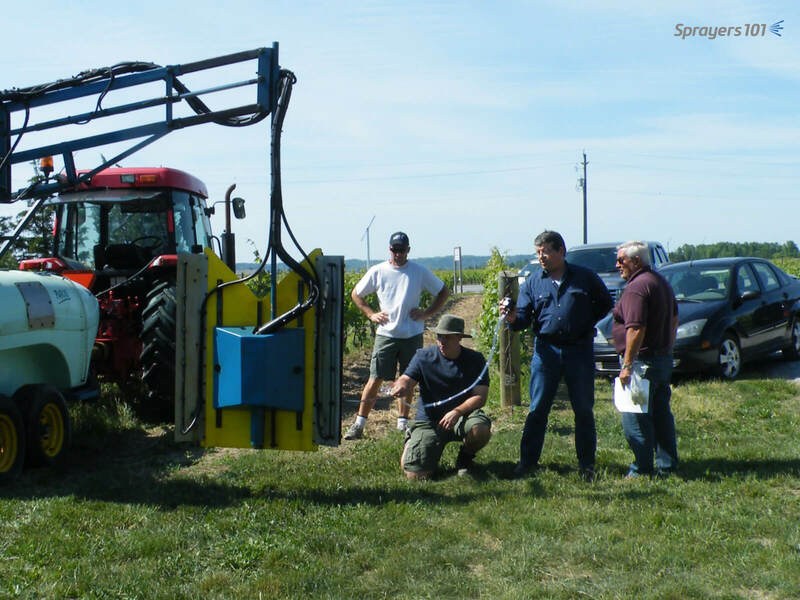 Record the set-up for each sprayer/block combination and keep a copy in the tractor cab(s). 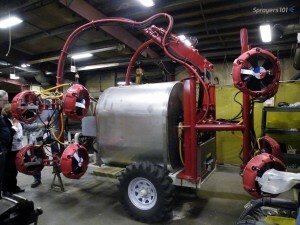 his Slimline sprayer is just one more interesting version of an airblast sprayer. 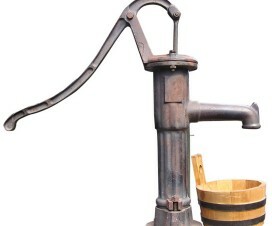 It features a dozen Sardi fans with six nozzles apiece. The airspeed from each fan can be independently controlled for precise applications. This method is not definitive; there’s some interpretation involved. It is more important to ensure the tapes do not stand straight out rather than to move every tape. You eventually want the spray-laden air to penetrate the canopy just beyond the midpoint (e.g. the trunk), not to blow out the far side. During an April calibration workshop in a peach orchard we encountered a situation worth noting. The cross wind was gusting up to 13 k/hr, which was not ideal, but we were assembled, so we proceeded. The sprayer was a smaller model and despite our best efforts it was unable to move the ribbons on the far side of the tree (which was at silver/green tip). However, when water-sensitive papers were placed in the tree, and the spray booms turned on, the papers received more than enough coverage throughout the canopy. How did that happen? 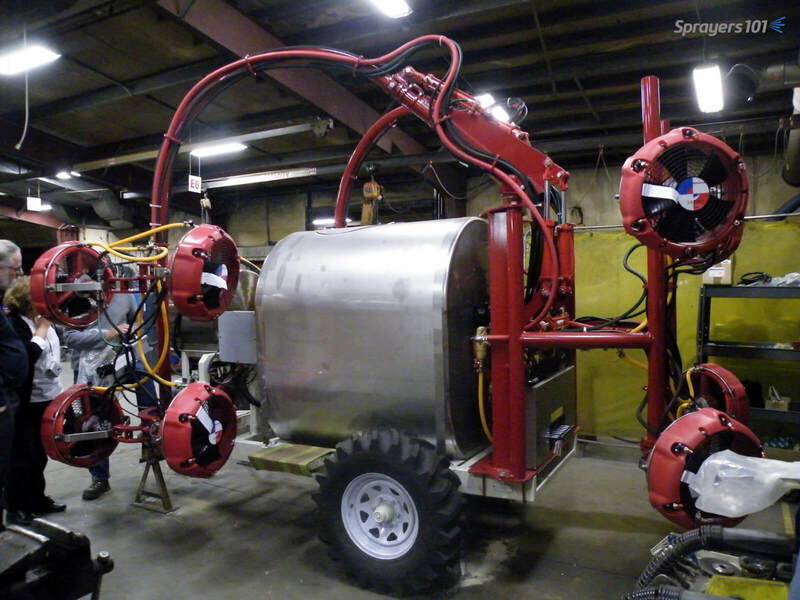 The sprayer was equipped with nozzles that produced large droplets and high volumes, and the moderate air combined with the operating pressure was sufficient force to drive the swath beyond the trunk, but not quite out the far side of the canopy. When the tree was sprayed from both sides, coverage was more than sufficient. 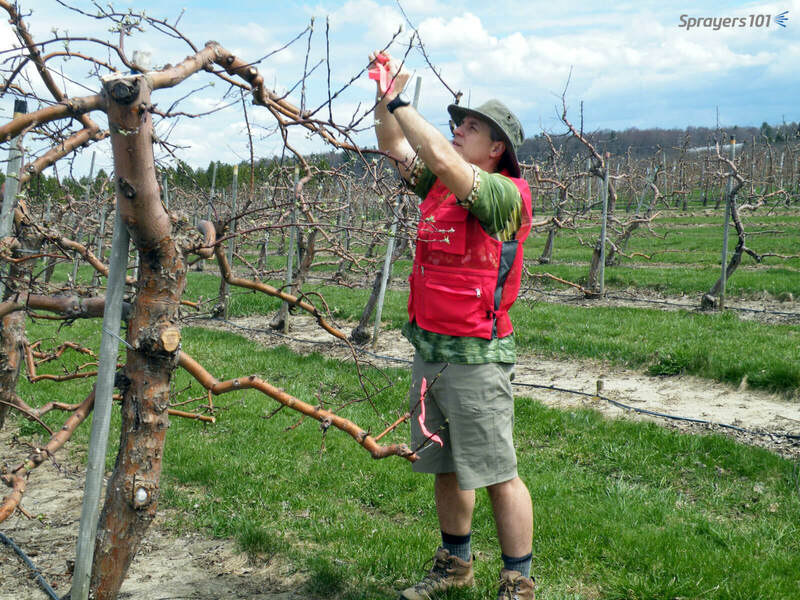 This situation is more likely to happen in orchards that are semi-dwarf or larger. Obviously, calibrating in such a high wind isn’t advisable (the downwind swath drifted terribly), but the situation did show how relying solely on this flagging tape diagnostic might give a false negative. This is why calibration must include an evaluation of spray coverage, which is described in another article (X). On the other hand, if you are unable to prevent the ribbons from standing straight out, you might consider blocking a portion of the sprayer air intake. 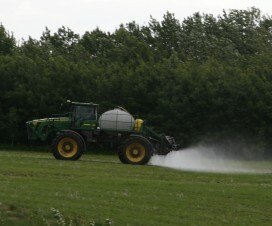 This technique is not covered in this handbook because many sprayer manufacturers advice caution or do not recommend this method. Instead, consider using the Gear up – Throttle down method, described in another article. 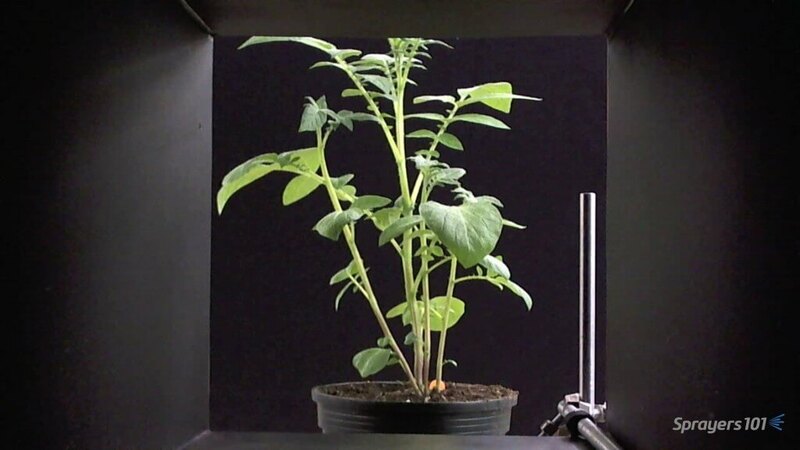 Dr. Bernard Panneton (Horticultural R&D Centre, Agriculture and Agri-Food Canada) performed a series of experiments exploring the relationship between potato canopies and wind, and his observations extend to all broad leaf crops. Bernard showed that as wind speed increased, the percent of leaf surface area exposed to spray also increased, but only to a point. If the wind got too fast, the percent of leaf surface exposed to spray dropped significantly: ~20% less! His interpretation was that low to moderate air speeds just ruffled the leaves, exposing their broad surfaces to spray more consistently. When air speed became excessive, leaves and twigs aligned with the wind, exposing only their thin edge to spray. The take home lesson is that spray will be more likely to impinge on all target surfaces when air speed and volume are calibrated correctly. 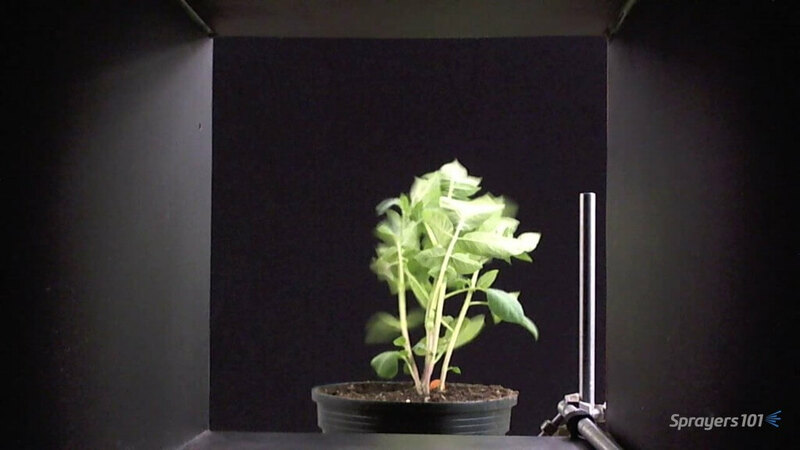 Potato plant in a wind tunnel exposed to 18 km/hr wind (high wind speed). Note the deformation and reduced surface area. Photo credit – B. Panneton, Quebec. Potato plant in a wind tunnel exposed to 0 km/hr wind (still conditions). Photo credit – B. Panneton, Quebec. 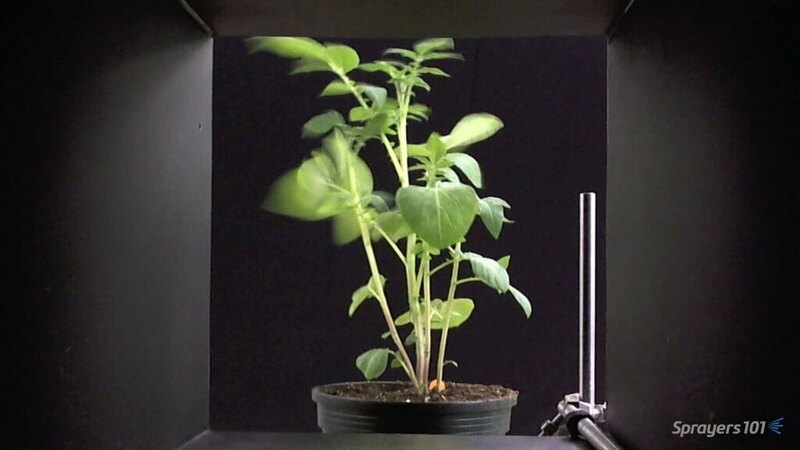 Potato plant in a wind tunnel exposed to 10.8 km/hr wind (moderate wind speed). Note how the leaves ruffle, increasing the opportunity for spray coverage. Photo credit – B. Panneton, Quebec.